If the required output voltage is higher than the rated voltage of the chosen given converter, then the outputs of two converters can be connected in series in order to achieve the desired output voltage. It is recommended that two converters with the same model are used for this application. The high isolation of the converter outputs allows multiple converters to be connected in series simply by connecting the positive output of one converter to the negative of another as shown in figure 1. It is recommend to use an external diode to prevent damage to the converters during start-up. The voltage rating of the external diode should be larger than V1+V2. When converters are connected in series, additional external filtering is strongly recommended, as the converters switching circuits are not synchronized. It is possible there will be a summation in phase of the ripple voltages of the two converters. When connected in series, designer must ensure that total output voltage does not exceed the working output to earth breakdown voltage of either one of the power supplies. 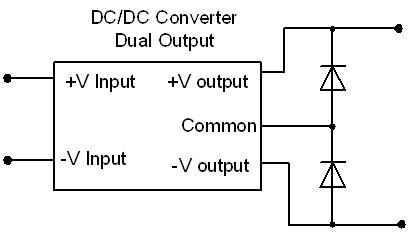 It is possible to connect a dual output converter to have a single output with double the nominal voltage, as shown in Figure 2. Normally a dual output converter will have two loads, one load is connected between +V output and common, and the second load is connect between –V output and common. When a single load is used it is connected between +V output and –V output leaving the common unconnected. Example: a dual output converter with a +12VDC output and a -12VDC output is used. When connected to have a single output the output voltage is +24VDC. Two diodes are used to prevent reverse current from damaging the converter.